I am a chronic juice waterer-downer. R doesn't mind and G doesn't get juice frequently enough to notice, so every morning when R requests juice, I top off the glass with half water. I buy the Mott's for Tots Juice Boxes, but the other day when I reached for a bottle of Mott's for Tots juice, it hit me...why not make my own? 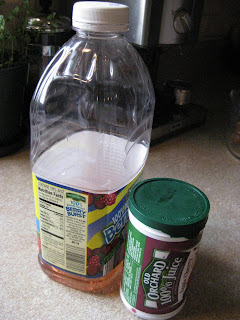 Pour half of the concentrate (cost $1.25) in an empty juice container (cost=$0.00) and mix with water to fill it about 3/4 full. Give it a good shake and voila, homemade "juice," at a fraction of the cost of the M4T. I like the Old Orchard brand of juice because the lid is resealable, so you can freeze the remaining half of juice concentrate for your next batch of juice. I am with you all the way on this. My son hardly ever drinks juice, has never sipped on a soda ever and I think making your own is def the way to go!!!!!!! Julia is still under the impression that the way you "make" juice is to add half water to it. :) I'm going to keep this up for as long as possible! Oh great idea!!! Thanks for sharing it! I love a good savings. That's a great idea. I've never bought juice concentrate, but we don't do much juice around here. However, I would just use a regular pitcher or other vessel for the juice. I know that there has been talk about reusing the plastic water bottles and how it's not so great because they aren't supposed to be reused ... I would imagine the same could be said for the bottle. Actually, Slacker Mama is right. Plastics with a 1 or 2 should not be reused. Use a cute pitcher! !